One of Connecticut's Class 1 WTMA streams was paid a visit to in the early morning hours of Sunday. I decieded to fish this stream early before the bright sun of the day brought out the dog walkers, who promptly send the local stream residents into hiding, remaining so until the sun starts to set. So armed with my Sage 3wt and a few Bombers I walked to the stream. It was still somewhat dark and kind of spooky in the still morning air. Upon ariviving at the first pool, which looked like a cold mirror, I set the Bomber on a drift. It did not take long before the fly was intercepted by a beautiful wild brown. 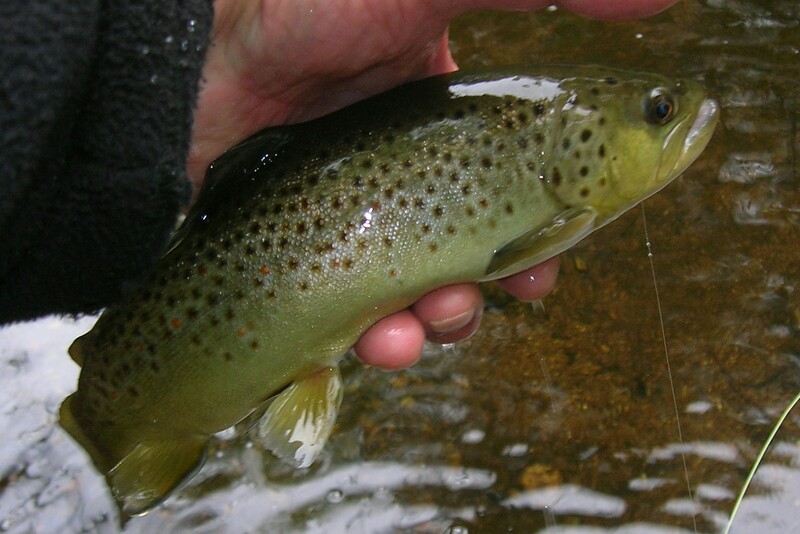 I continued to fish the pools and runs of this stream which produced many more browns. As I approached a tailout of a pool with a sunken log, I said thats a trout ambush stie. The Bomber ended its run along the log and just hung there a moment. A "Wicked Hard" strike took place and the fish was airborn, a valient fight persued and soon the fish was in hand. To my surprise it was a brook trout. A quick photo and off he went to do battle with the browns for that special lie in the stream. There are several fly tyers who tie tiny flies, and fished these with good success. After viewing many of their creations I decieded to attempt a few myself. I chose a pattern I was familiar with the Ausable Wulff and gave it a whirl. All though they are not size 22 or 26 they are the smallest fly I've ever tied. I am fortunate to have many small freestone streams close to home. 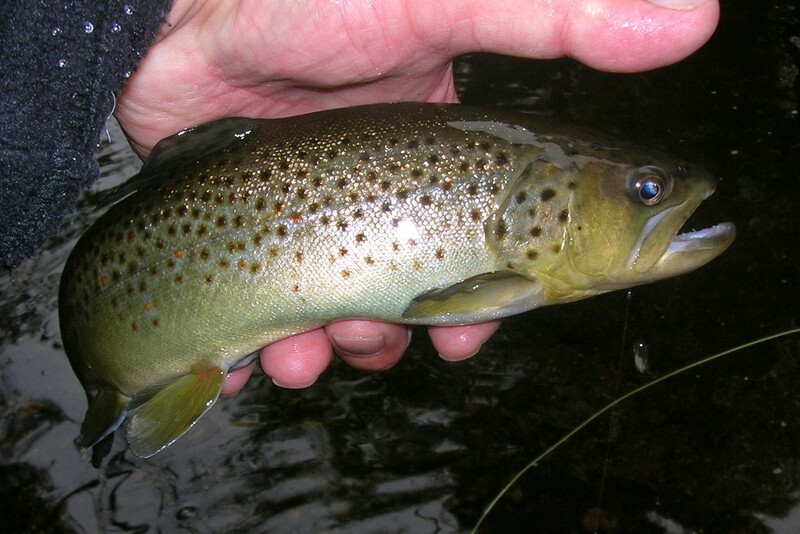 These streams hold good populations of wild trout. These are two of them that I fished over the last few days. The streams produced many trout, and oh so many rises. Caddis, and Wulff flies were all that were needed. The waters remain cool, with the shade of the tree canopy. A diferent stream under cloudy skies. These days of May have been wonderful. Warm days and cool nights. The streams have been a bit on the low side, but the waters have remained cool. Some rain of the past week has helped. The fields and the woods have really greened up, plenty of wild flowers blooming. I probably enjoy the walks to and along the streams as much as I love the fishing. Bright, beautiful colors in the field. Wild as the colors in the stream. All thats needed for a few hours. Prime wild brook trout habitat. My self and twenty or so other fly tyers will partake in a challenge to tie a Rangeley streamer as Carrie Stevens did in her day. The rules are this. Tie the streamer with no vise, the hook will be held in our fingers and compleated in that fashion. The only tools allowed are a bodkin, bobbin, and scissors. We will have one shot to compleat the fly, no practice flies, no do overs. This August 15 is the 40th anniversary of Carrie Stevens Day at Upperdam Maine. The streamer to be tied is Carrie's Favorite. I was given the opportunity to fish a small stream in western Connecticut this past Sunday. I have never fished this stream before, but the flyfisher "Apache Trout" who told me of its location and the little wild one's who call it home. We met at stream side and fished the afternoon. The fly selection mostly dries enabled the two of us to achieve many hookups as well as a few to hand. The stream was beautiful with many glassy pools, riffles and pockets. It is deeply shaded which keeps its waters cool. I was very impressed with the little stream and the wild one's who live there. 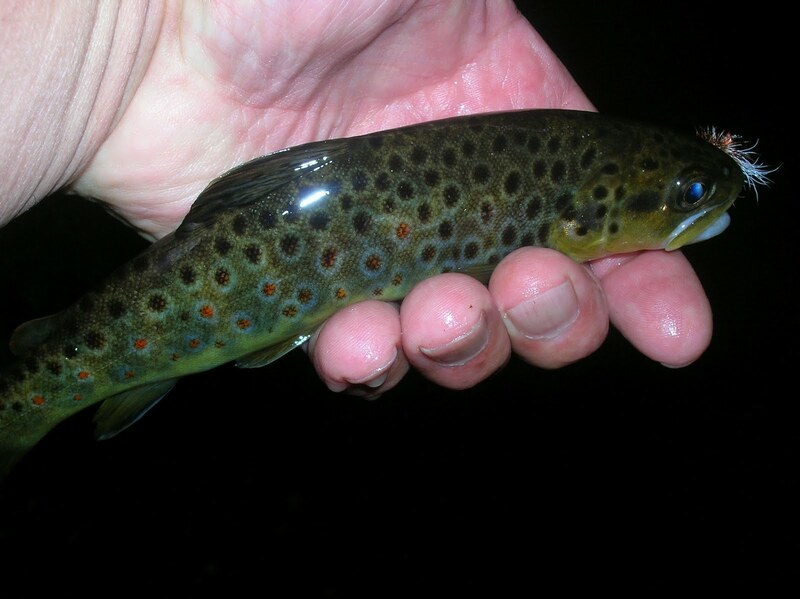 In several of the photos" Apache Trout" can be seen stalking the wiley browns with a Mountain Caddis. Please enjoy this stream as I did. A streamer named by Maineguide for Grandaughter Natalie. It will be fished at Baxter State Park in Maine this summer. I decieded to fish a stream late yesterday afternoon into the early evening. The stream is covered heavily with hemlocks and it was quite dark in places. The stream was clear and crisp as was the air. I started fishing dries, Bombers, Adams Parachutes, and Wulffs but with no responses, although a few rises were noted. I tied on a streamer, Edson Tiger and soon hooked up to what was a brookie I believe. There was a brief skirmish, he went right and the streamer went left. I walked down the stream fishing likely fish holding spots but no more hookups. One area that caught my eye earlier as prime holding water proved not to be, but back on the way out I fished it again. Two drifts with the fly and two varied retrieves brought no response. On the third cast, closer to the tree I flash darted out and a hookup took place. The fish felt strong and almost took me into the submerged debris. Finally I was able to bring the fish to hand. 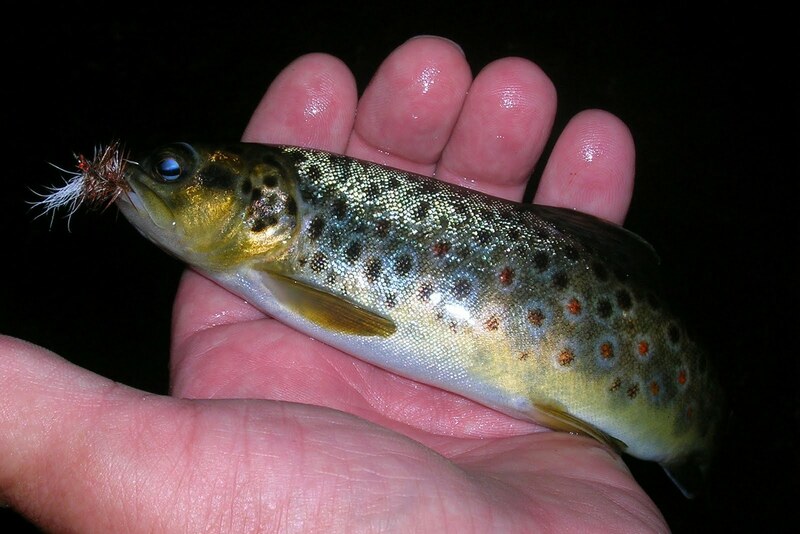 He was a brown of about 12 inches with some heft to him. I could see this guy liked to dine on smaller brookies. After a few seconds of holding him in the stream he darted swiftly for the safety of the undercut. We just returned from a two day trip to Cape Cod, MA. This is a trip we have been taking for several years now, going in the Spring and Fall. 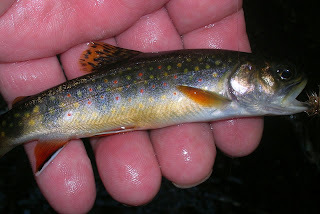 There are several streams on the Cape that hold self sustaining populations of wild sea run brook trout, called salters. The two streams we have knowledge of are truly beautiful areas set aside and protected for future generations to enjoy. The streams were full of river herring, which spawn in the Spring and are making a comeback after years of decline. They are protected from harvest as are the salters. The brookies in the two streams were plentiful, just buy the amount of swipes at the fly. Their size were small, but they were very aggressive. The brookies prefered small streamers as the fly of choice. Over the years of fishing these streams there has been ongoing restorations, providing habitat for these special sea run brookies to survive. 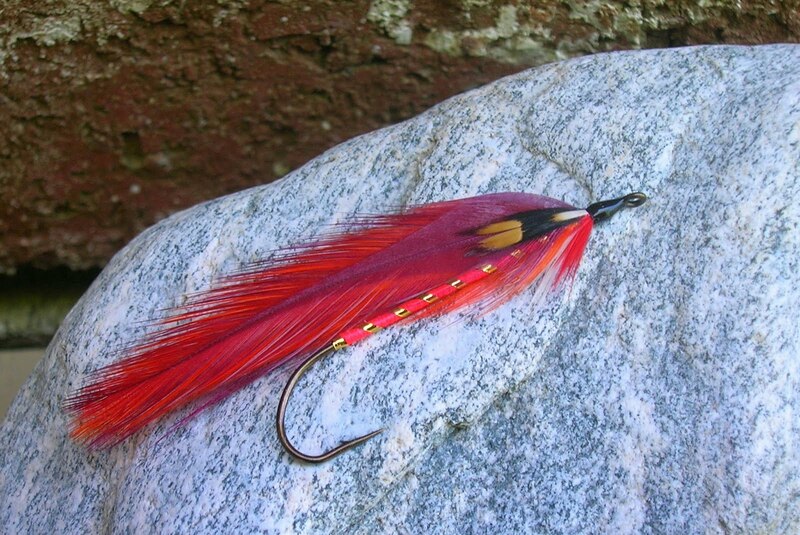 Over the years one of my passions has been the streamer fly. Ilove the graceful look of its fine lines, created from feathers, silks, hair and tinsel that make up their construction. I started tying these flies back in 2001, being inspired to by the birth of our first grandchild, Morgan. She was born in December of 2000. I had no knowledge of the streamers construction but had come across a website called Raske's New EnglandStreamers, and my education began. There were many contributors to the site and all of my questions were answered by polite and very knowledgeable fly tyers. Some of my first flies were very crude but became much better as I went along. I was fortunate to be able to pick the brains of a few tyers who always took the time to respon to my requests. Chris Del Plato of New Jersey, Bob Petti, of New York, Emmett Johnson, of New Jersey, and Phil Foster of Farmington Maine. I'll post various streamers and try to give some history of the flies as well as the tyers who dressed them.